Learning how to exercise with arthritic knees is important for anyone suffering from, well, arthritis. Sounds obvious enough, but you would be amazed how many times I meet people who stop exercising BECAUSE they have arthritis. This is literally the last thing you want to do! Exercise is often the only thing standing between you and going through a total knee replacement. Oh, and guess what, if you have already had a total knee replacement guess what is crucial for your optimal recovery?…yup, exercise. So, needless to say, exercise is a necessity when it comes to not only arthritic knees, but arthritis in general. Now this a blog dedicated to exercising at home, not a rehab blog. So, I might be crossing the line a little with this post, but I think it’s important, so I’m ok with it…I hope you are too. And besides, just because you have arthritis doesn’t mean you shouldn’t be able to enjoy the benefits of exercising at home in your own home gym. Having bad knees doesn’t mean you have to give up all exercise, just means you may have to adapt a little, and that’s ok. I’m here to help. As a physical therapist, I spend my days trying to teach folks the power of using exercise to improve strength, mobility, and function. Exercise can be a powerful tool and I believe it’s crucial for everyone, regardless of age, size, or gender to exercise daily. We could sit here and talk about all the health benefits of exercise for days without discussing all of them. Let’s just agree that exercise is good for us, but what if pain in our knees makes it difficult to exercise? I hear this all the time: “I can’t exercise because it hurts my __” (fill in the blank). You might be surprised, but I also hear this often: “It feels better after I do my exercises”. As a therapist, the makes sense to me (and I’m silently thinking to myself “no duh, that’s why I gave you those exercises”). But getting people to find a way to exercise around the pain is difficult. The fear of pain can be as debilitating as the pain itself. People suffering from arthritis or other forms of chronic pain get used to everything hurting to a certain degree. The pain becomes a part of your daily routine. Everything hurts, so, if I try to exercise, of course that will hurt (probably). This mindset actually hinders people from participating in exercise routines, I see it every day and it can be hard to break. But if you can break that mindset and start moving a little more, your quality of life can make drastic improvements. Finding gentle exercises and progressing over time is the way to go. Before we get into a little more detail, I wanna make sure we are all on the same page with regards to arthritis itself. Arthritis, or “old arthur” as many of my patients like to call it, comes in several varieties. Typically, when someone is referring to “arthritis” they are talking about osteoarthritis. Osteoarthritis (also known as degenerative joint disease (DJD) is a condition in which the cartilage wears down between two bones in a joint. As the cartilage wears down, the space between the two bones becomes smaller and smaller until eventually we have the dreaded “bone on bone” situation going on. As the bones start rubbing together, we typically are feeling pain, stiffness, weakness. You might feel or hear popping and crunching going on in the joint. The joint might be sore to the touch, might look or feel swollen. Think about the brake pads on your car…with time and use, the pads lose their thickness and you start noticing that the car doesn’t brake as smoothly…that’s kinda how our joints feel (I hope that makes sense, I don’t know much about cars). As our joints lose that cushion in the middle, it becomes more uncomfortable for that joint to move. That’s as in-depth as I want to get for this blog’s purpose. 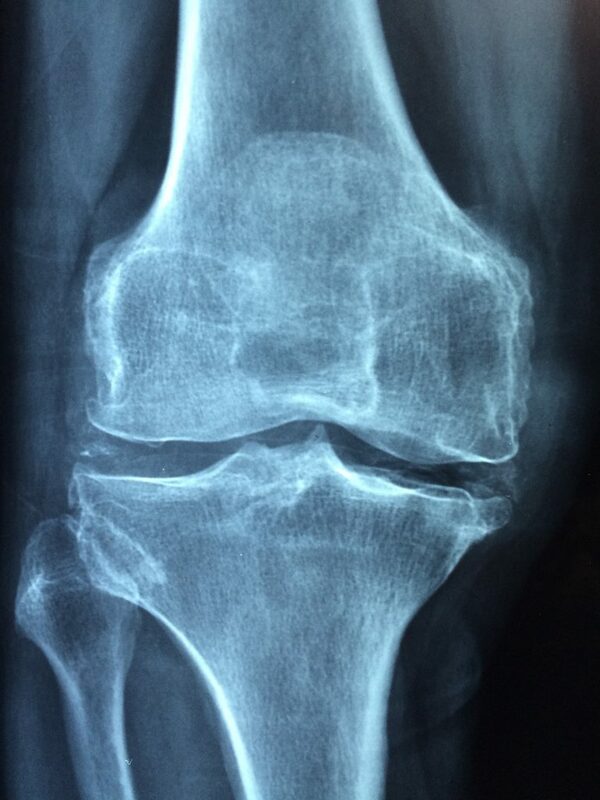 For more information on osteoarthritis, click here. I want to discuss exercising for the knee joint specifically here, but arthritis can occur in any joint in the body. Typically, if you have arthritis in your knees, you have arthritis in other places as well. Just because you have arthritis doesn’t necessarily mean you will have pain. If you x-rayed 100 middle-aged people that were pain free, odds are 100 of them would have some signs of arthritis. Ok, so arthritis causes the space between my joints to decrease, which leads to grinding of the bones on each other. It does sound a little counter intuitive that moving that joint could actually help get rid of the pain. I know, I agree. Sounds kinda crazy. But trust me, I’ll explain. With the very basic explanation I gave above, I didn’t mention that most of our joints (the synovial ones anyway) contain fluid as well. This fluid is called synovial fluid. This fluid is like the oil between the cartilage of the two bones in a joint. Oh, we all agree that a joint is just where two bones meet right? Ok, good. This fluid becomes important in arthritic knees because even though we are losing that good cartilage cushion, we can still try to take advantage of the synovial fluid that is still in there (the oil). If you can find a comfortable way to keep your arthritic knees moving, that synovial fluid is pumped through the knee, “lubricating” the joint if you will. I mentioned that stiffness is a common complaint or symptom with arthritis, especially in the knee. Sitting in one spot for any length of time becomes uncomfortable, the knees are stiff and achy when you finally get up. After you start moving a little the knees gradually ease up…sounding familiar? That’s arthritis. The only way to get around that stiffness is to get that joint moving. Problem is, we have to find a comfortable way to get those knees moving in the first place. I wouldn’t suggest starting the day out with some deep lunges if you are suffering from arthritis in your knees…you just aren’t going to enjoy that one. Closed chain exercise is preferred to open chain– that’s a PT way of saying keep the foot attached to a stationary surface. For example, squats are considered closed-chain and leg extension would be open chain. They just tend to be more comfortable, less stress through the knee cap, etc. I hope the 6 tips above make sense, I feel like I started rambling a little toward the end. Again, this is an exercise blog not a rehab blog, sometimes I have to tell myself that, sorry. So how can we find a low-impact, continuous, closed chain (debatable) exercise from home that will strengthen both our quads and hamstrings (and glutes!) while remaining comfortable and non-weight bearing?? I have 2 words for ya…RECUMBENT BIKE! Owning a recumbent bike is a great way to get gentle, low-impact exercise from home. Think about it, if you have ever been to physical therapy, what is the first thing they normally have you do? Warm up on the recumbent bike! Most therapy clinics have a recumbent bike (or NuStep, more on those in a later post) because they are super gentle on our joints. Luckily, you don’t have to bust the bank to purchase one for yourself these days. The recumbent bike is so gentle because of the angle you are pedaling at, that is, you are recumbent. Recumbent is just another word for lying down or reclined. Being in this horizontal position automatically reduces the the amount of stress you are putting through your knees and hips. Being in this reclined position also makes pedaling on a recumbent bike more comfortable. One of the draw backs of a typical upright stationary bike for a lot of people is comfort. The seats are smaller and you don’t have back support. Remember, most people suffering from knee arthritis also have arthritis in other joints, including the back. Pedaling on an upright bike for longer periods can become uncomfortable in the low back as well as hips. These issues are normally resolved by switching over to a recumbent bike. Comfort is a big concern and often the excuse people with arthritis give as to why they are not exercising as much as they should. If using a recumbent bike takes the comfort concern off the table, there’s no excuse not to be exercising! Now just because recumbent bikes are comfortable and low-impact on the joints, doesn’t mean you can’t get one heck of a workout on one. Recumbent bikes, like any stationary bike, can offer a great cardiovascular workout if you use it correctly. You can also strengthen your quads and hamstrings effectively, as well as your glutes to a lesser extent. It’s important to find a machine that offers enough variability in the resistance settings to fine tune your workout. Depending on the severity of your arthritis and your pain level, pedaling on the lowest resistance just for active range of motion (AROM) may be enough. And you can still take advantage of the benefits by doing this- decreased stiffness, decreased pain, improved mobility. But if you are able to tolerate it, it would be nice to gradually ramp up the resistance as tolerated to get some of the strengthening benefits. For more info on recumbent bikes and the difference between recumbent and upright bikes, check out an earlier post I did by clicking here. I wanted to finish this post with a quick review of a nice, affordable recumbent bike that I think would work great for people with arthritic knees. The Schwinn 270 Recumbent Bike made my list for best recumbent bikes under $500 in my previous post, but I wanted to mention it again here because I believe it would work great for people with arthritis. Obviously there are nicer bikes in the higher price brackets. But if you are just looking for a nice, comfortable ride that will feel fine on your arthritic knees, the Swinn 270 will have you covered. Schwinn has been a trusted manufacturer of road bikes and fitness equipment for over 100 years. I think it’s important to be aware of the manufacturer’s reputation when purchasing fitness equipment. Do your research, get to know them. You know, kinda like you are doing right now. Anyway, Schwinn is old school and classic- they have been delivering high quality products for a long time and that is why they have thrived for as long as they have. Average user rating of 4.5/5! So there you have it. A very dependable piece of workout equipment for a great price. With the rising cost of everything these days, it’s nice to see you can still get a good deal if you know where to look. I like this recumbent bike for arthritic knees because it is designed with comfort in mind and it offers a great deal of variety with resistance…25 levels of resistance to be exact. There are even cheaper recumbent bikes on the market and I’m sure many of them will provide an adequate mode of exercise for achy, arthritic knees. Just be aware that cheaper models are going to be less durable and less comfortable. They are going to offer less resistance and workout variety. And they may not feel as smooth and quiet while you ride. Click here to learn more about the Schwinn 270 Recumbent Bike. It’s time to show arthritis who is boss. Arthritis is no longer going to be the reason why you are not exercising. We never stop exercising, we just learn to adapt our exercise to our abilities. Exercise is a life long process. We’ve discussed briefly what arthritis is and why it causes pain and stiffness in all joints in our body, especially our knees. Know we know that movement is the best thing we can do to reduce that pain and stiffness. We know that it’s important to find gentle, low impact movement that we can do continuously to help lubricate those joints and keep them moving more comfortably. I discussed why I think recumbent bikes are great for people with arthritic knees. The recumbent bike must have been designed with arthritis in mind because it is so perfect at providing a low impact, comfortable form of exercise. Lastly, I offered an example of a great, affordable recumbent bike that would allow you to exercise in the comfort of your home. Who needs to go to a commercial gym when you have your own home gym! I hope you enjoyed reading and I hope this article was helpful. Remember, I am not a medical doctor and I have not performed a therapy assessment on you. If you are having severe knee pain see your doctor before trying anything that could make you feel worse (that said, the recumbent bike is about as gentle as exercise gets). As always, leave me a comment or email and I’ll get back to ya soon. What Is The Best Vegan Protein Powder On The Market Today? 12 Foods To Eat And Lose Weight- Just In Time For Thanksgiving! Today is day 2 of my left knee rehabilitation program. My program is focused on squats because I have a cage and not much else at home. The recumbent bike looks like the ideal solution to low impact exercise and would compliment the squats very well. It’s going to be a hard decision though, I will have to get rid of the couch to make room. I watched a Youtube video also where a bloke made his own inverted leg press at home, looks dangerous. I can relate to this article. I do get pains from my knee at times. I agree, you have to power on and exercise. I do yoga, and it helps a lot! The bike is also a great idea! Good for you for finding a way to exercise around your pain. Yoga is awesome. I wish I was better at it but I’m pretty awful…I really should stretch more. Thanks for reading.